Step right up! This circus-themed scratch card is sure to become one of your faves..it's too fun not to! There's loads of cash up for grabs, brights graphics and more! See you at the circus! Roll up roll up and win some real cash prizes with carnival themed Big Top Bucks scratch card. The fun big top circus theme is great fun and the prizes up for grabs are great too. Big Top Bucks scratch card gives you plenty of chances to win. Scratch away three matching symbols and there's a prize coming your way. Quick and instant, Big Top Bucks provides an immediate answer - did you win or lose? 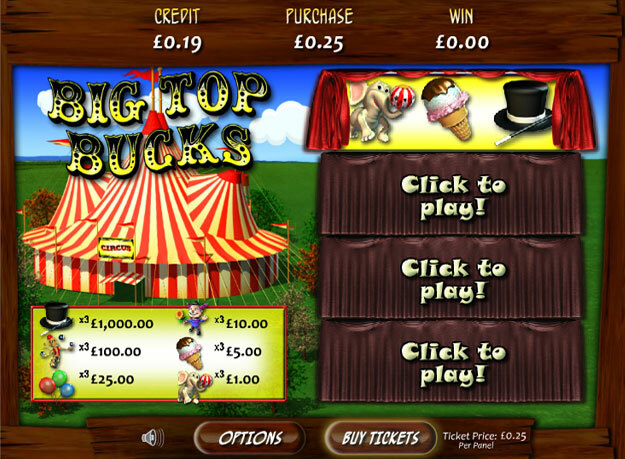 Big Top Bucks at for instant wins and great fun.